Breaking down organisational silos is wishful thinking in companies with an ambition to make better business results through a collaborative and inclusive working culture. Employees with same expertise and competencies speak the same language and often run in the same direction, but the disadvantages of silo thinking can be little or no collaboration across sectors and no innovation. 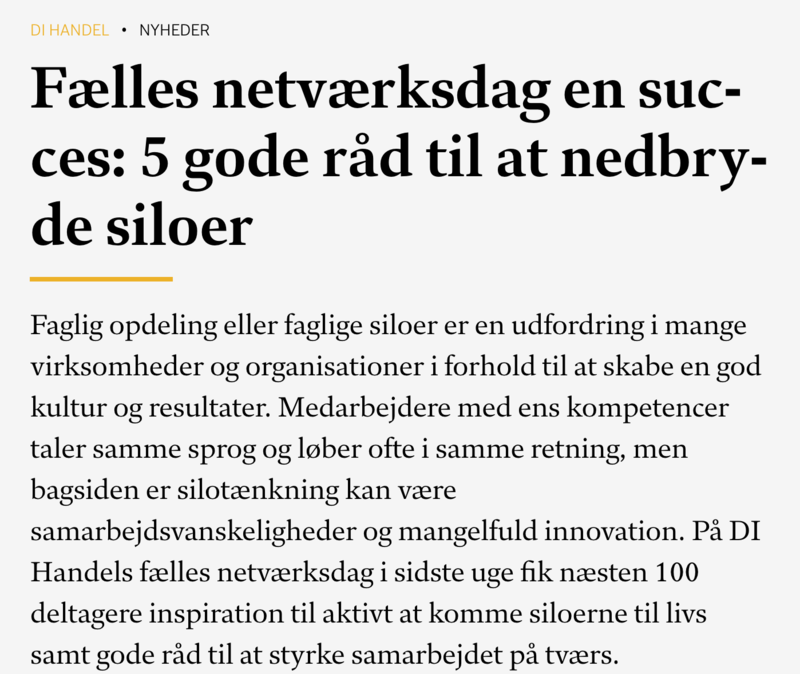 In The Confederation of Danish Industry’s Trade’s joint Network Day last week LIVING INSTITUTE inspired almost 100 participants to actively break down silos by following 5 simple steps. Vi synes selv, vi er høflige i Danmark, men på den anden side af grænsen er de ikke enige. – De har meget godt at sige om os, men de siger samstemmende, at vi er uhøflige. De mener, at vi har dårlige manerer, siger hun. Read about the workshop aimed at finding new solutions to closing the gender gap in the music industry promoted by JazzDanmark and the Danish Composers´Society, facilitated by LIVING INSTITUTE’s chief consultant and founder, Heidi Rottbøll Andersen. The workshop, one of many activities during the Women Deliver Conference, took place on May 19th 2016 in Kødbyen (Copenhagen). The companies that come closest to having equal numbers of men and women in management, have a 55 percent higher EBIT than companies with few or no women at the top, Heidi Rottbøll Andersen, founder and director of the consulting firm Living Institute, says. She has advised several hundred companies on diversity over the years. 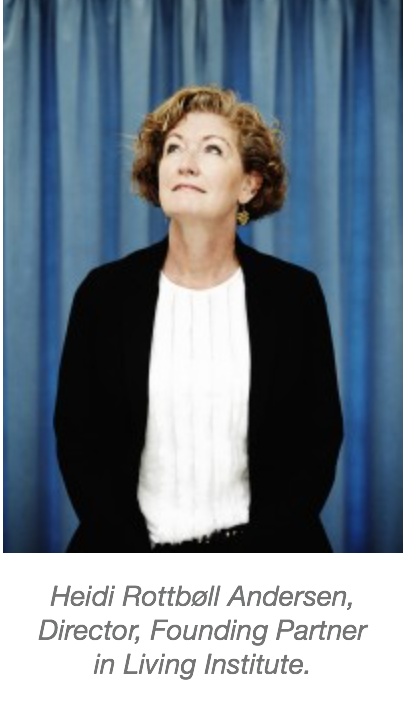 In 2004, Heidi Rottbøll Andersen founded The Living Institute, a consulting and training company aimed at helping companies in Denmark with practical ways of tackling cultural differences in the work place. Diversity is the key word: an open eye and a practical mind, the company is mostly engaged with expats coming to work in Denmark, and to a lesser degree, also involved with Danes returning home. Apart from the consulting business, The Living Institute offers crash courses to freshly arrived foreigners and their partners. “So you can share you Danish experiences with each other,” says Heidi. The Living Institute has developed the much-acclaimed presentation: Why are Danes so Weird? What to do if your diverse team of highly specialized employees with different nationalities lack intercultural competencies? The solution is cultural intelligence according to Heidi Rottbølll Andersen, Chief consultant and founder of LIVING INSTITUTE. For 11 years she and her team has infused cultural intelligence into more than 250 companies world wide. Both gender and cultural intelligence are absolutely key for a successful company. In this interview for Business Traveller, LIVING INSTITUTE’s founder Heidi Rottbøll Andersen digs into interesting facts and examples, highlighting the importance of these issues. How could Cultural Intelligence have helped LEGO’s CEO and Lars von Trier? Danes often come across as a bit insensitive if you ask Non Danes – but does it matter? Watch the interview with Heidi Rottbøll Andersen, LIVING INSTITUTE’s founder who talks about what Non-Danes see when they interact with Danes. Danes are impolite … according to Non-Danes. Blind spots: Are Danes impolite or is it just tribal tendencies playing out? Is it true that Danes do not suffer from fear of getting laughed at (gelotophobia) which can bring them into odd situations and sometimes even jeopardizing their global activities. Listen to Denmark’s Radio P1 Eftermiddag where Heidi Rottbøll Andersen, LIVING INSTITUTE’s founder talks about what Non-Danes see when they interact with Danes. Heidi Rottbøll Andersen talks about the power of diversity. Research shows that diversity is a strong competitive parameter…. when handled properly. Børsen 23rd of April 2014. Heidi Rottbøll Andersen discusses whether or not it is correct to call Denmark a Christian country. Kristelig Dagligblad 25th of April 2014. Talk at by Nivedita Eskesen, Consultant LIVING INSTITUTE, at the event arranged by PhD Association at the Faculty of Health at Aarhus University on October 8th. 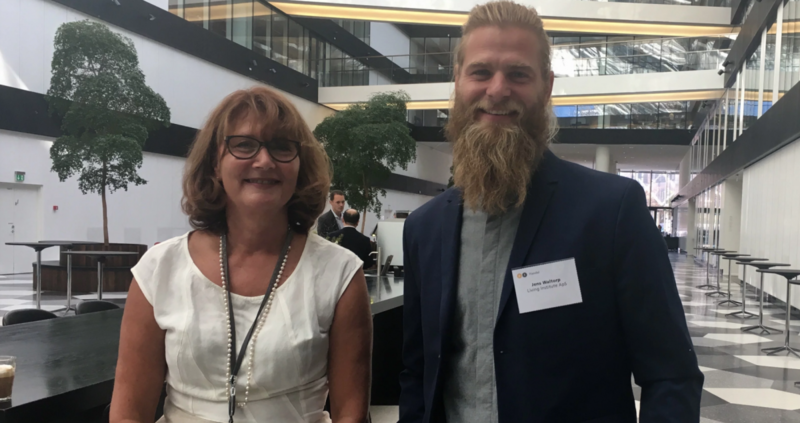 The cultural encounter (or conflict) between Danish and international researchers was on the agenda at a seminar on internationalisation entitled “Researchers without Borders”, organised by the PhD Association at the Faculty of Health. “A posting abroad is a fantastic experience. If you get the opportunity, you have to do it. But be realistic, not everything is rosy”, says Heidi Rottbøll Andersen, Director of LIVING INSTITUTE, offering cultural training to companies posting employees abroad. We need to stop seeing it as a failure or unrequited love if foreigners leave us after seven good years in the country, but we all have a responsibility to ensure that they stay longer than two years. Unhappy spouses are often the reason why highly educated foreigners leave Copenhagen. This is evidenced in a study by Johanne Mygind, senior researcher in LIVING INSTITUTE RESEARCH made in collaboration with Copenhagen Economics. “Only when knowledge of the two cultures is combined, we can build a bridge and get the best out of diversity”, says Klaus Schröder Pagh, CEO in LIVING INSTITUTE, in an article about how we help our clients to build bridges between Danish and Chinese culture. Cultural intelligence and global retail? Yes – there is a strong interconnection between the two. Read about LIVING INSTITUTE’s mission on infusing cultural intelligence into global retail. Article about LIVING INSTITUTE’s work with Danish companies in India – Intercultural team-building sessions. “The Indian engineers have to know that in Denmark you get rewarded when you point out when something is wrong.” says Heidi Rottbøll Andersen, owner of LIVING INSTITUTE, which has organised workshops about intercultural teamcollaboration between Indian and European teams for Danish companies in Chennai and Surat in India. There are great opportunities in international management, there are just too few who actually do something about it. Modern, international leaders should dare to bring themselves into play, says the British expert, Michael Green, who was in Copenhagen recently. “When a Danish company is going to a meeting in Japan, it’s nice to know that the Japanese rarely make use of lawyers, but make oral agreements where a word is a word…” Read the article about LIVING INSTITUTE’s work to equip ALK Abelló’s employees and management to work with their new Japanese partners. Danish companies are screaming for labour, preferably from abroad. But during their free time foreigners are often given the cold shoulder – and then they are likely to leave again. 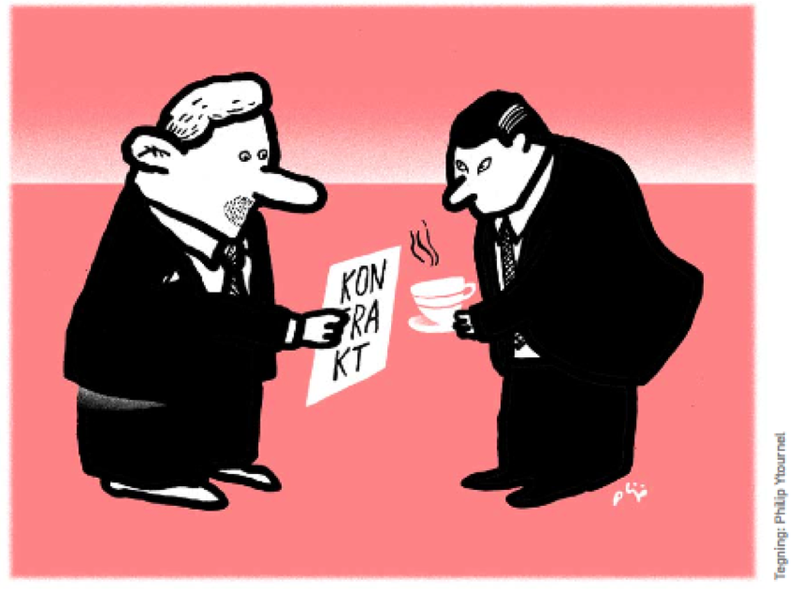 It is expensive for the companies and also for Denmark in the longer run. See videoclip and interviews from LIVING INSTITUTE’s Danish Living Crash Courses for foreign knowledge workers – the courses help to retain the wanted foreign employees. A study shows, that even highly educated and well-travelled Danes are bad at including foreign colleagues. We must learn to appreciate the background conscious foreigners as Prince Henrik rather than the integration eager Alexandra, expert says… Read the article where Heidi Rottbøll Andersen, Director of LIVING INSTITUTE chastises our ability to accommodate even small cultural differences. Contribution to the debate by Heidi Rottbøll Andersen, Director of LIVING INSTITUTE.